Despite the fact that the Internet has become the go-to source for researching, most writers remain reference book junkies. I’m no exception. Inevitably this habit leads to dubious acquisitions. My copies of Roget’s Super Thesaurus, Merriam Webster’s Geographical Dictionary, and The Complete Directory to Prime Time Network and Cable TV Shows, 1946–Present,” for example, languish unopened on my bookshelf, there only because—thanks to some variation of Murphy’s Law—I just know that I’ll have desperate need for them once I drive them over to Powell’s to be recycled. There are, however, their polar opposites, several books that are indispensable, ones that I’d recommend that you add to your collection if you have even passing interest in the craft of writing, whether or not you make your living as a writer. Every seven years or so, the University of Chicago Press issues a new edition of this, the granddaddy of editorial style books, first published more than a century ago. The dust jacket of the latest edition, number 16, proclaims that this is “the one book you must have if you work with words.” I concur. It’s all-inclusive, comprising over 1,000 pages with topics organized into three major parts: the publishing process, style and usage, and documentation. There’s a dizzying amount of information here, making it the final arbiter in most questions that have to do with punctuation, grammar, capitalization, hyphenation, abbreviations, number usage, and—oh, forget about it! It’s just too damn comprehensive to summarize in a few words. All I know is that I love this tome and could not live without it. Most used section: “Compounds and Hyphenation,” a topic that I find perpetually perplexing. Others do too, evidently: The book devotes 12 pages to this subject, 10 of them in a table format which lays out specific words and phrases, along with the rationale for including or excluding a hyphen. Sometimes the rationale is simply “That’s what Webster’s says.” For example, who can explain why hyphens appear in “stick-in-the-mud” but absent from “a flash in the pan”? And why is the sky blue, anyway? 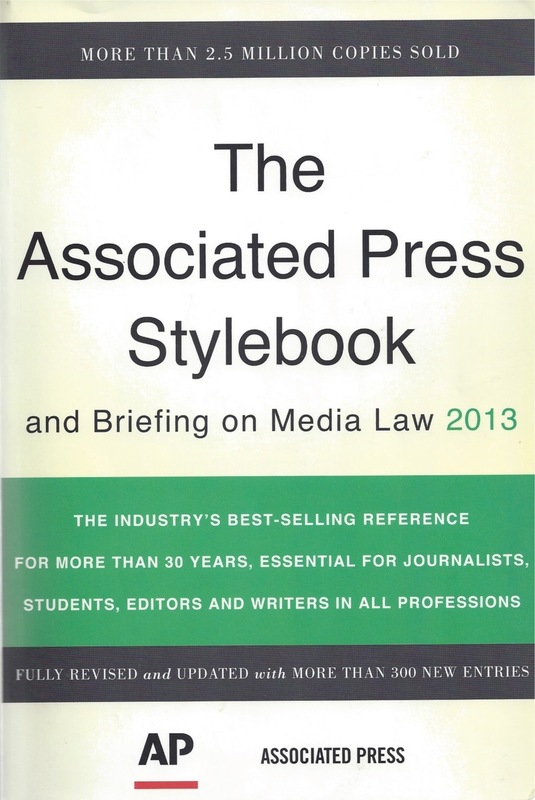 Easier to navigate than The Chicago Manual, the Stylebook is in some ways even more useful. 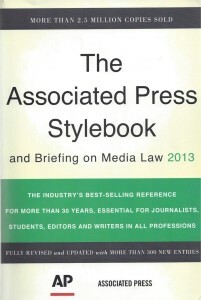 The bulk of the book is an alphabetical listing of problematic words and topics. For example, for “Xmas” you’ll find this simple rule: “Don’t use this abbreviation for Christmas.” Under “weapons” you’ll find thumbnail definitions for nearly three dozen types of guns and ammunition, pretty useful when you’re writing that next serial-killer novel. Most used section: “Punctuation Marks and How to Use Them,” a topic fraught with controversy and an area in which these two books offer advice that occasionally conflicts; for example, the Stylebook says “Dickens’ novels” while The Chicago Manual prefers “Dickens’s novels.” You could sidestep this hornets’ nest by writing “the novels of Dickens,” but that would be the coward’s way out. Take a stand, for God’s sake. Or just flip a coin. Sure, you’ve got your quotes from Shakespeare, from FDR, Noel Coward, Hippocrates and a couple of thousand other luminaries. But one of the great things about Bartlett’s is that these hot shots share space with the likes of Yogi Berra (“You can observe a lot by watching”), Groucho Marx (“I never forget a face, but in your case I’ll make an exception”) and Robert Crumb (“Keep on truckin'”). 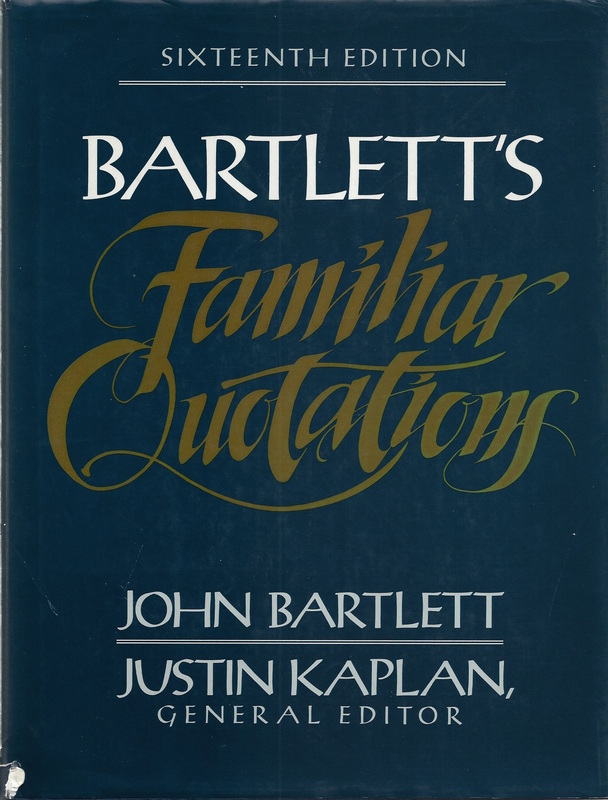 While there are online sites that warehouse notable words from near and far (I’m particularly fond of Quotes of the Day), nothing can replicate this impressive tome which will take the space to quote entire passages when they’re worthy enough, a chunk of Hamlet, for example. You know you’re dealing with some serious wordage when a book has an index–an index–of more than 600 pages. 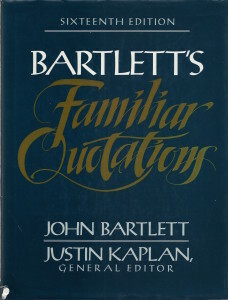 Pictured above, by the way, is an older edition. The latest, number 18, was issued just several years ago. What about you? Are there any reference books that you just can’t live without? Ones that you particularly love? Drop me a line and I’ll include your comments in a future post.